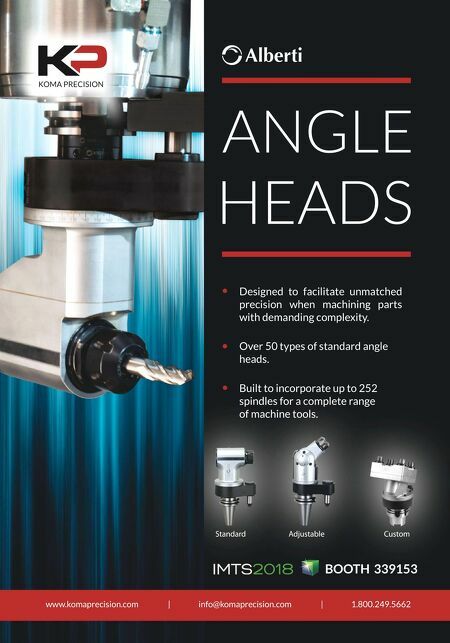 SHOP TALK MMS JUNE 2018 50 mmsonline.com Industry News American manufacturing operations. The mood at CCMT was different. Our small contingent from MMS publisher Gardner Busi- ness Media focused mostly on builders that did not already have a presence here. Although these companies face similar uncertainties and perhaps even greater export barriers as the South Koreans, many seemed undaunted by the challenge of pen- etrating a new market. "There's no limit to invest- ment in China," summed up Ignacio Alfayate, general manager of Group Nicolas Correa Asia, about the business climate in the world's No. 1 producer and exporter of machine tools. 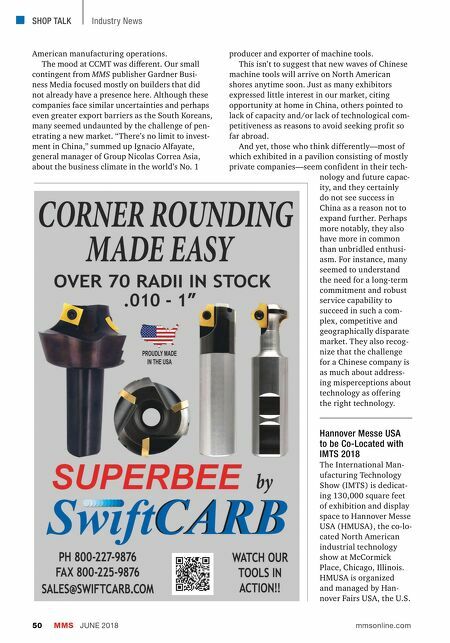 This isn't to suggest that new waves of Chinese machine tools will arrive on North American shores anytime soon. Just as many exhibitors expressed little interest in our market, citing opportunity at home in China, others pointed to lack of capacity and/or lack of technological com- petitiveness as reasons to avoid seeking profit so far abroad. And yet, those who think differently—most of which exhibited in a pavilion consisting of mostly private companies—seem confident in their tech- nology and future capac- ity, and they certainly do not see success in China as a reason not to expand further. Perhaps more notably, they also have more in common than unbridled enthusi- asm. For instance, many seemed to understand the need for a long-term commitment and robust service capability to succeed in such a com- plex, competitive and geographically disparate market. They also recog- nize that the challenge for a Chinese company is as much about address- ing misperceptions about technology as offering the right technology. Hannover Messe USA to be Co-Located with IMTS 2018 The International Man- ufacturing Technology Show (IMTS) is dedicat- ing 130,000 square feet of exhibition and display space to Hannover Messe USA (HMUSA), the co-lo- cated North American industrial technology show at McCormick Place, Chicago, Illinois. HMUSA is organized and managed by Han- nover Fairs USA, the U.S.